Before camp starts—and before the kids get cooped up—go somewhere special with the family. Take this quiz to choose the right destination for your crowd. 1. Which scent appeals to you? b. Tropical palms and fragrant flowers. c. Woodsy pine and freshly cut grass. 2. Which animal would your kids be most excited to see? 3. Which of these treats would your kids devour instantly? a. Funnel cake, nachos and hotdogs. b. An organic, fresh fruit smoothie. c. They like trying new things—whatever taco or cupcake truck is the hottest in town. 4. Which of these is a top priority for a family outing? 5. What’s your family vacation soundtrack? a. Upbeat pop and sunny rock. c. My kids are the soundtrack! Take me to the spa! 6. What’s the kids’ favorite way to have fun at home? a. Playing with the dog. b. Going swimming or playing outside. c. Building a huge blanket-and-pillow fort in the living room. a. High. I can tune it out as long as the iPod’s blasting. b. Medium. It grates on my nerves, but it’s par for the course. c. Low. Get. Me. Outta. Here! 8. What’s the best way to sleep? a. With the sound of crashing waves outside my window. b. Camping—nothing’s better than being one with nature. c. In the comfort of my own bed! 9. Which of these upcoming blockbusters is your family dying to see? a. Jurassic World, the Jurassic Park sequel. b. Minions, a story about the origins of the minions in Despicable Me. c. Pan, a live-action version of Peter Pan by Warner Bros.
10. What’s your favorite thing about living in Houston? a. Being close to the Gulf. b. The rich activities and events every weekend. c. I love Houston, but love traveling even more! Here’s Where You Should GO! A trip to the Houston Zoo (www.houstonzoo.org) and the surrounding museum district is a quickie way to get away! 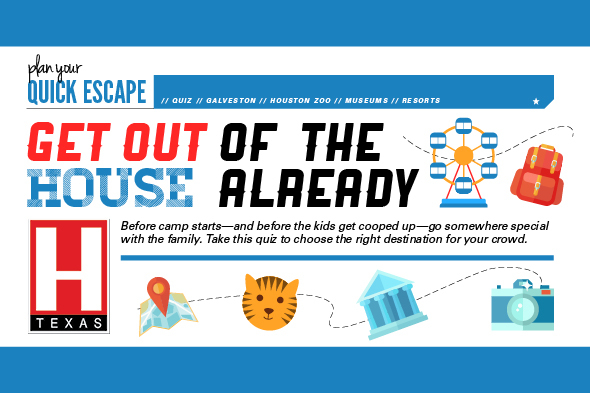 Make it a “stay-cation” for the family, and take advantage of all the enriching activities that Houston has to offer. Becoming a member of the zoo has it perks: special hours for members to beat the crowds, invites to events and special previews of new exhibits. Keep an eye on the zoo’s daily calendar to know when zookeepers will be giving talks on your children’s favorite animals or when feedings will take place. We’re exhilarated at the thought of the gorilla exhibit—the home for seven new gorillas—coming in May 2015. It will be a part of the African Forests Exhibit that features giraffes, rhinos and zebras. Next to the zoo, you’ll find the Houston Museum of Natural Science (www.hmns.org), which will be hosting a magnificent and interactive shark exhibit through September. 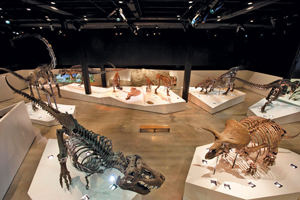 The museum also has a paleontology hall and a section devoted to Texas wildlife that showcases our great state’s diversity in species. The Cockrell Butterfly Center is a must-see, thanks to the rainforest and 50-foot waterfall housed in a three-story glass structure. For the young and curious ones, the Children’s Museum of Houston (www.cmhouston.org) offers immersive experiences designed to let creative and scientific juices flow with exhibits that emphasize invention and finding out how things work. Both museums offer free admission on Thursdays; the HMNS is from 2 p.m. to 5 p.m., and the CMS is from 5 p.m. to 8 p.m.
Galveston is only an hour away, and you can make a long weekend of it with your family. While there’s plenty of fun to be had on the shores and in the sand, try Schlitterbahn Galveston (www.schlitterbahn.com/galveston), which has thrilling slides and covered attractions to beat the heat. Lounge in style under cabanas that are available through reservations with wait service, complimentary water bottles and more. There’s also bonus perks for purchasing tickets at Schlitterbahn: savings for the Galveston Pleasure Pier! The discount works both ways; you can visit Pleasure Pier (www.pleasurepier.com) first and save on your visit to Schlitterbahn. 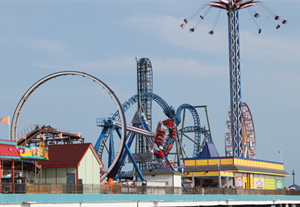 The Pleasure Pier, newly renovated in May 2012, hosts restaurants, shops, games and 15 rides, like the thrilling Iron Shark Rollercoaster and the Galaxy Wheel, which allows you to take in a stunning view of the coast. For a more breathtaking experience, try the Texas Star Flyer, the tallest swing ride in Texas at 230 feet above sea level! Continue the adventure at Moody Gardens (www.moodygardens.com) with its new five-tier, obstacle rope course and zip-lining activity. After the adrenaline rush is complete, wind down with the family at Palm Beach, which is Galveston’s only white-sand beach, complete with a lazy river and wave pool. Moody Gardens also has an aquarium, a rainforest experience, and 3D and 4D special-effects theaters. Head north to some outstanding resorts beyond city limits. The Woodlands Resort & Conference Center (www.woodlandsresort.com) has been named one of America’s Most Family Friendly Resorts by Fox News. The rooms make you feel zen with their warm décor, and most of them have balcony or pool walkout access. 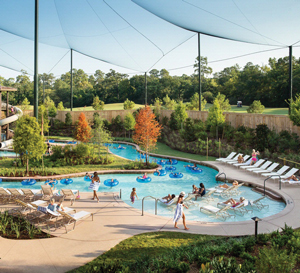 Explore The Woodlands’ surrounding nature with a family bike ride, or take it easy at the resort’s serene Forest Oasis Waterscape, where you can tube down a lazy river surrounded by trees.